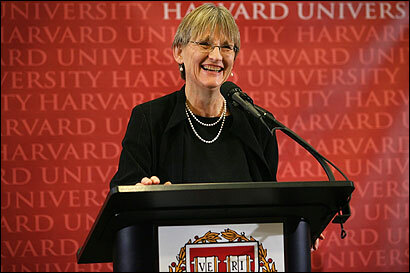 CAMBRIDGE -- Drew Gilpin Faust , a Civil War historian and Harvard University dean, grew misty-eyed yesterday as she declared, "I can imagine no higher calling, no more exciting adventure than to serve as the president of Harvard." Harvard's two governing boards unanimously approved Faust's selection as the 28th president yesterday, then gave her a standing ovation, toasts with champagne, and hugs and kisses before she appeared at a late-afternoon news conference. Faust, 59, who will take the reins on July 1, promised that she would strive to make Harvard a better place, particularly by encouraging more collaboration across a divided and unwieldy institution. She also said in a brief interview that she was moved by the reactions from women and men alike to her appointment as the first woman to lead Harvard, the oldest university in the United States, founded in 1636. She said she has been flooded by e-mails and calls, stopped on the street, and cheered on an airplane. "I am the president of Harvard, not the woman president of Harvard," she said. "Nevertheless, people see this as part of a new day." At her first news conference in the Barker Center, she acknowledged the leap she is making from running a small think tank, the Radcliffe Institute for Advanced Study, to managing a major university. "Nobody's been president of Harvard until he or she has been president of Harvard," she quipped to dozens of journalists and supporters as she stood behind a lectern below a bust of John Harvard. She noted that search committee members had asked her about making the jump in repeated questions "in every possible guise" before she was selected. Overseeing the Radcliffe Institute, she said, gave her a "broad view" of the university that allowed her to work with every school on campus and learn about many of their issues. "I've been on the ground. . . . I've seen it close up," Faust said. "Clearly there's a lot I have to learn and there are a lot of people around who are going to help me." Today , she will make time for the history class she is teaching this semester and sit down with interim president Derek Bok and his staff to plan the transition so she can be ready "to act promptly and decisively" once she starts, she said. Faust said she will focus in the near term on filling four deanships, for the Faculty of Arts and Sciences, the medical school, the Graduate School of Design, and for the post she held at the Radcliffe Institute. Members of the search committee, which included six members of the Corporation, Harvard's main governing board, and three Overseers, praised Faust's wide-ranging intellect and leadership abilities. "Drew wears her extraordinary accomplishments lightly," said James R. Houghton , chairman of the search committee and the senior member of the Corporation. "Her many admirers know her as both collaborative and decisive, both open-minded and tough-minded, both eloquent and understated, both mindful of tradition and effective in leading innovation." Faust is the first president of Harvard without a Harvard degree since 1672. Still, she scored points because she was both an insider and an outsider, having spent the last six years at Harvard and the previous 25 teaching at the University of Pennsylvania, said Nannerl O. Keohane , another search committee member and the former president of Wellesley College and Duke University. "You can bring in a breath of fresh air or you can have someone who knows Harvard deeply," Keohane said. "One of the things that turned out to be appealing in the end was the balance she brings." Over several interviews, the committee also saw how quickly Faust learned. "She had done more homework," Keohane said. "She showed her capacity to grow and learn, and [by the end of the process] she was clearly deeper in her understanding of what the job would mean." Members of the Board of Overseers said they went into yesterday's meeting determined to be more than a rubber stamp, especially after the tumultuous end to Lawrence H. Summers's presidency a year ago. Before Faust was invited into the meeting, the overseers, a board of alumni, spent about an hour discussing the search with the search committee, which had conducted its work in secret. During the search, committee members consulted more than 150 individuals, via e-mail or in-depth interviews, about Faust, committee members told overseers at the meeting. Around 1 p.m., Faust arrived at the meeting in Harvard's Loeb House, kissed her husband, Charles Rosenberg, a medical history professor at Harvard, on the cheek and slipped inside the brick building, where the two governing boards waited. The champagne was already chilled, but Faust submitted for about an hour to pointed questions from both boards. The group gathered in chairs around her. A memorable moment, overseers said, came when one person asked what she thought would be the biggest challenge. Many people believe one of Harvard's biggest faults is that power lies in individual schools that don't easily cooperate. Faust told the group her biggest task would be creating a more collaborative process to allow the university to move forward. "That's a very important answer," said Mitchell Adams, an overseer and executive director of the Massachusetts Technology Collaborative, a quasi-public development agency. "Harvard is so enormous and so complicated and balkanized with powerful sects of self-interest that have a high degree of independence. There's nothing like it. . . . We all have confidence that she'll be able to do it." Faust emerged from the meeting about three hours after she entered, smiling as Houghton wrapped an arm around her shoulder. She appeared calm and relaxed as she went to face the press. Jessica Rosenberg, Faust's daughter, accompanied her to the news conference. Faust vowed to lead the institution with an eye toward building on its strengths but also "recognizing what we don't do as well as we should -- and not being content until we find ways to do better." She thanked Harvard's last three presidents with a nod toward the controversy that clipped Summers's tenure short, saying his "powerful thinking and impatience for results cleared the way for important new initiatives." During Summers's five-year tenure, professors were divided over whether he was shaking up a complacent faculty or he was impeding results with his confrontational style. Faust said she intended to use the presidency as a bully pulpit to talk about higher education. Despite the troubles that led to Summers's resignation, she said she was taking over a university that "seems to be in a very upbeat frame of mind." Bok, who was Harvard's president from 1971 to 1991, welcomed Faust to the job, and said she has a "special array" of qualities that will make her successful, including her experience, scholarship, and a collaborative approach. "Drew," Bok said, and turned to her, "you have a wonderful job. Don't let anybody tell you this is the most difficult job, and the most onerous. . . . You will enjoy it. You'll be very glad that you did it. . . . It was really the best 20 years of my life. It will be for you, too, probably more like 30 or 40." Bombardieri can be reached at bombardieri@globe.com. Sacchetti can be reached at msacchetti@globe.com.